Finally, Google has decided to provide free HTTPS certificate (SSL) for all bloggers who are using a custom domain name with Blogspot blogs. By enabling this free SSL certificate, all those who run Blogspot blogs with custom domain names will be able to project more professional blogs with higher trust level before their readers. Another advantage of activating SSL certificate in the SEO point of view is the chance of getting higher ranks in Google organic search results. It is because SSL is considered as a factor which decides search engine rank in Google. 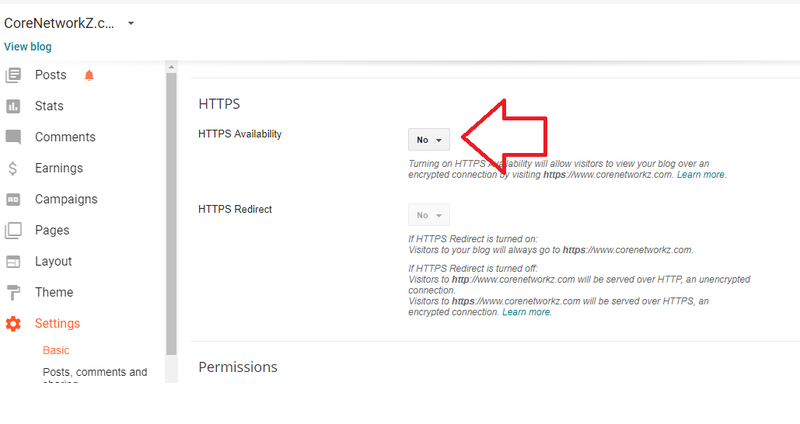 Now let us check how to activate free HTTPS availability offered by Google for Blogspot blogs using custom domain names. To turn on Free HTTPS Encryption feature with Custom domain Blogspot blogs, follow the steps below. 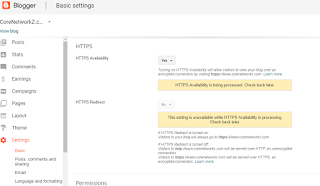 On the Basic Settings page, you can see HTTPS Availability under HTTPS. Once blogger saved the settings, your Blogspot blog with the custom domain name will be able to view over a secure encrypted connection. For example, my blog will be able to view on the following address "https://www.corenetworkz.com. Though your blog will have more trust in Google's point of view and gain more potential to rank higher in organic search results rank, there are some problems associated with the use of a free SSL certificate. Let me explain that. Well, if you do not think the custom domain name set on your blogger account is correct, follow the instructions provided in the link below. As it clearly said on Blogger dashboard, "Visitors to http://www.corenetworkz.com will be served over HTTP, an unencrypted connection. Visitors to https://www.corenetworkz.com will be served over HTTPS, an encrypted connection", is the major problem you are going to face after you turned on HTTPS encryption on your blog with the custom domain name. Having two copies of the same content may trigger duplicate content issues. This duplicate content issue has the potential to reduce your chance to get higher SERP on Google Search Engine. However, Google has provided a solution to this problem. We can simply turn on "HTTPS Redirect". Once "HTTPS Redirect" is activated, all traffic to your blog will be redirected to the secure address. So, no more duplicate content issues. In order to redirect every visitors who are clicking the nonsecure HTTP links of your blogs to https version, follow the instructions below. 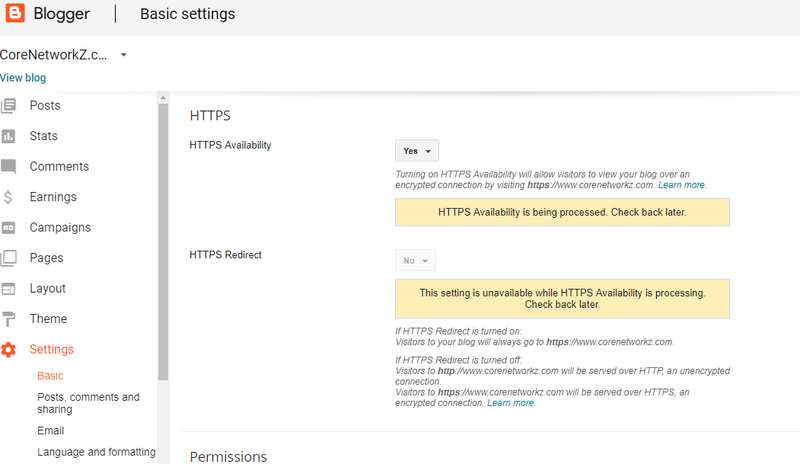 Under basic settings, you can see the "https redirect" option. You need to select "Yes" from the drop-down menu to activate https redirect on the custom Blogger blog. Once the settings are saved, you will see a message like it "Your HTTPS settings have changed. All visitors are now able to view your blog over an encrypted connection by visiting https://www.corenetworkz.com. Existing links and bookmarks to your blog will continue to work. ". 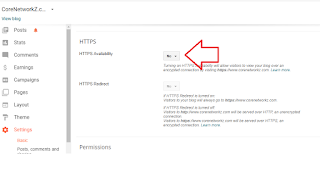 Once you have completed the above steps, I strongly recommend you to update both Google and Bing webmaster tools with your blog's new https address.